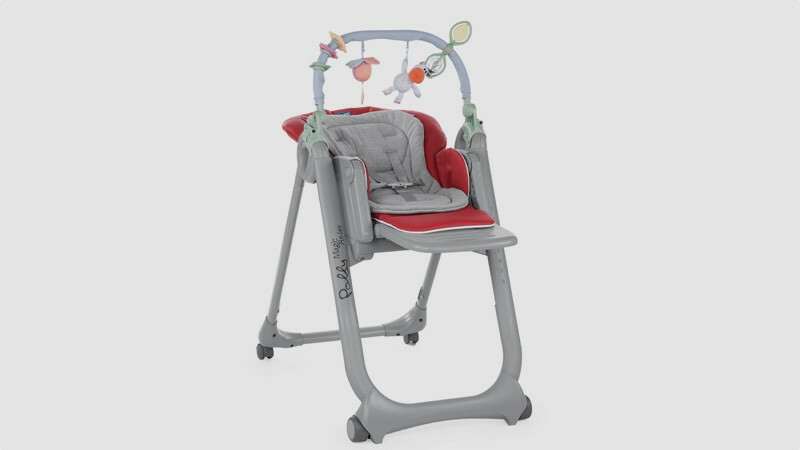 In an ideal world, the ultimate high chair would come with an invisible shield surrounding it to prevent your baby throwing food around your kitchen. Although we can but dream, sadly this is yet to be invented. You will however find a selection of top high chairs online that are compact, safe, easy to clean, comfortable and value for money. What high chair features do I need? 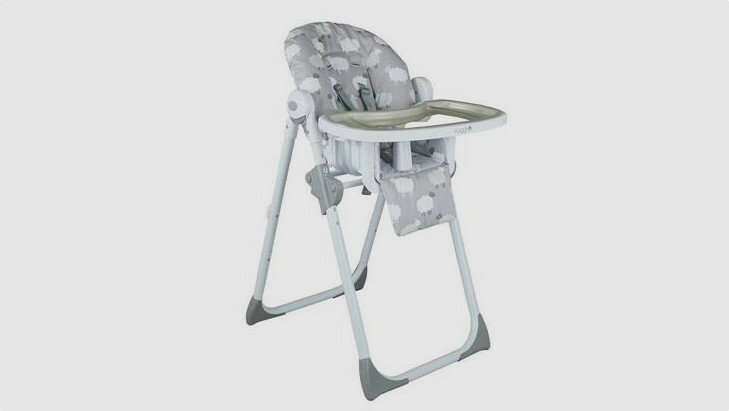 When looking for the best high chair, consider how versatile you want your high chair to be. Is it just for the weaning stage or are you looking for a chair to grow with your child into the toddler years? The latter will be more expensive, but usually longer lasting, made from something like wood for more of a “furniture” feel, rather than plastic. You’ll find designs that can be reclined to support a young baby’s neck and those with optional baby inserts – this means that even if your baby isn’t ready for weaning (current government guidelines suggest around 6 months old), they can still perch with you around the dining table, which is great for family meal times. Of course, you’ll want something that’s easy to clean. Fabric cushions can make this trickier, so make sure surfaces are easily wipeable or can be removed to wash, to prevent germs from harbouring in seams and creases. Three- or five-point safety harnesses are a feature in many high chairs, similar to the ones you’ll find in prams. These will be helpful when your baby is less steady in their sitting, but something they may find restrictive as they grow. Others feature waist and leg straps instead, and some offer a harness as an optional extra. A removable tray will allow you to feed your baby wherever in the house you are, and also double as an excellent surface for playtime, while giving you the option to take it off entirely as and when you want your little one to sit up to the table. Of course, if space is of an issue, consider a foldable high chair that can be tucked away when not in use. What types of high chair are there? 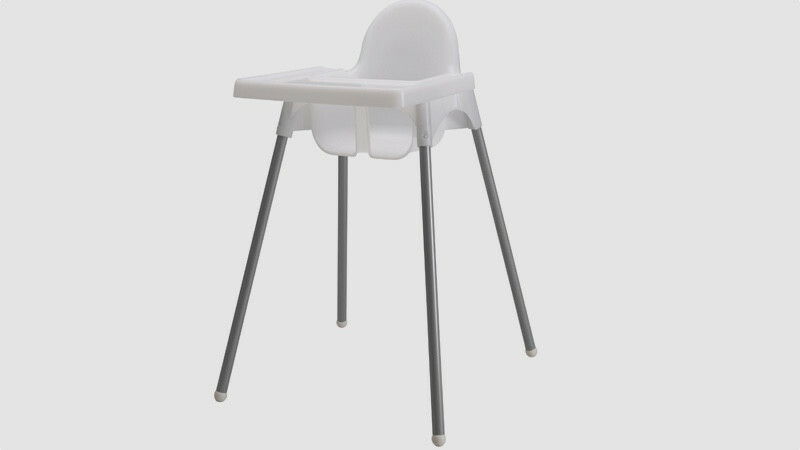 The most popular high chairs are the freestanding, standalone variety, which usually come with adjustable heights and removable tray inserts. They come in various styles and designs, but will be the type that most will buy. There are also clip-on high chairs, which are great for taking with you on the go. Often made of fabric to keep them lightweight, they literally clamp onto the edge of any table for a portable highchair without the bulk. Booster seats are a great option for older babies who need a bit of height on a regular dining chair to get them to the table. You can even get some hybrid high chairs that detach from their frame to become booster seats when your baby is a little older. How long will my baby need a high chair? Most babies will start using a high chair around 6 months of age, once you start the weaning process, although some will start earlier a little earlier. Once your baby can sit up confidently and consistently, which is usually any time between 9-12 months, you are able to transition to a booster seat if you wish. However, babies tend to stay in their high chairs until they are around 18 months – 2 years old. Most high chairs feature a weight limit that would serve the majority of children beyond this. How much should I spend on a high chair? Prices vary wildly for high chairs, but you don’t need to spend a fortune to get one that does what you need it to. You can of course pay into the hundreds, depending on features, design and – of course – brand name. But the high chairs in our list start from just £14, so you can pick one that best matches your budget. 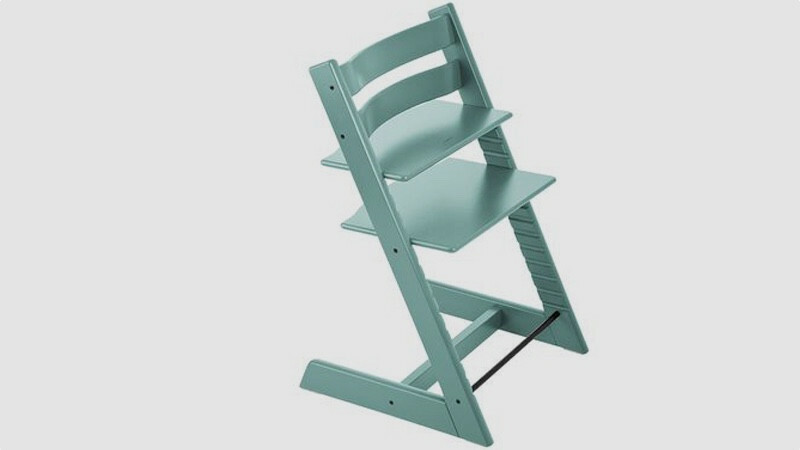 A perfect balance of form and function, the Stokke Tripp Trapp is a classic by Norwegian furniture designer Peter Opsvik. The high chair comes in a range of natural oak and painted colours including aqua blue (shown). It can even be personalised with an engraving of your child’s name. With its height-adjustable seat and footplate positions it lets you bring your baby and child up close to the dining table - although you can find copycats around, the Tripp Trapp is an unmistakable design icon. The baby set and cushion accessories are sold as extras for use at the weaning stage, but we think the chair comes into its own when kids get a little older. At around two years old for example, they can use the footplates as steps to climb into the chair and position themselves as king of the castle, or table at least. 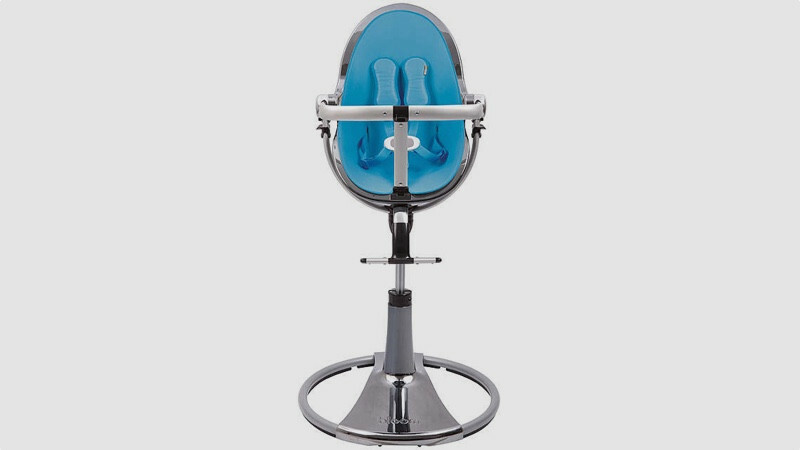 Although it’s a difficult design to fault, its feet gliders that stop the chair sliding and tipping back do have a tendency to slip off now and then, and so this is something to keep a close eye on. A snip at £14, Ikea’s Antilop high chair is a gem of a buy. Although we can’t say the same about a lot of Ikea’s furniture, the Antilop takes about two shakes of a lamb’s tail to put together – simply pop the four legs on the seat and you’re ready for weaning show time. The legs are easily detachable from the seat so you can transport the design in the back of your car boot fairly discreetly. The frame is basic and it’s not much to look at, but its pure white plastic seat and silver legs are contemporary and clean in design. Although it’s probably not the most comfortable of seats in our round up, you can add a baby cushion to the design. The padding can make the seat quite snug, so you won’t be able to use it for long, however. It’s the perfect height to be pushed up to the table, but you do have the option to add a tray, which is easy to clean and has raised edges to prevent spills from landing on the floor. With regards to the ceiling and walls however, you’re on your own. 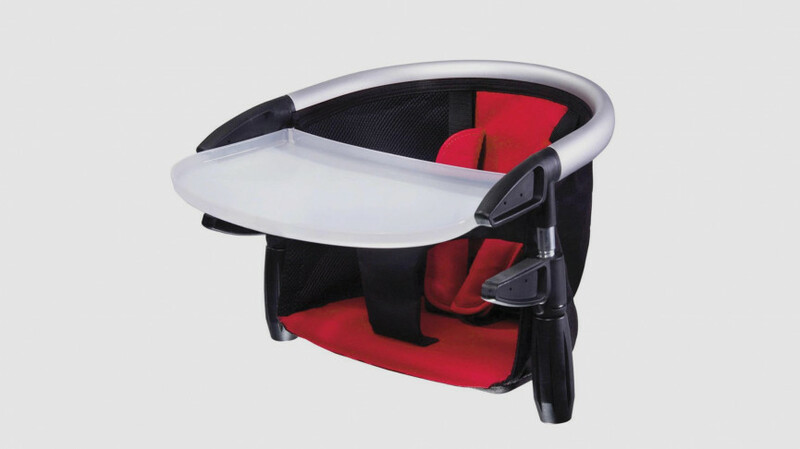 Its safety harness is simple in design, so if you have a particularly restless baby who can wriggle out of anything you may not want to stray too far from the table. And while the legs come out a little wide and you may find yourself tripping over them now and then, in short this design provides a safe and practical space for baby to eat and for £14 it’s a real win-win buy. Although it wouldn’t look out of place in Stockholm’s Design Museum, the iCandy MiChair was actually only launched a couple of years ago. If you’re familiar with their rather wonderful pushchairs – aka ‘baby travel systems’ - you’ll know that iCandy do not do things by halves. And again, with the MiChair the company has covered all bases. A versatile piece of parent kit, the iCandy MiChair is so much more than a standard high chair. It’s suitable from birth if used with the newborn Pod – a type of bouncer that can be attached to the highchair that you’ll have to pay extra for - and once baby outgrows the high chair it can be transformed into a rocking chair or chair for children up to the age of six. 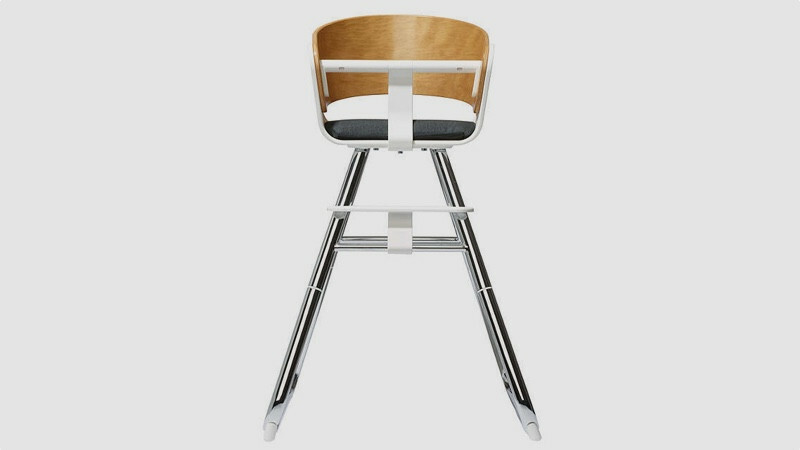 The high chair back is made from attractive beech and birch FSC plywood with high shine chrome legs. Its minimal in styling with a cross bar and post, so your baby can sit securely in place, and the removable tray is also dishwasher proof, which comes as a godsend #thelittlepleasuresinlife. If you want to make the seat a little cosier, you can add a comfort pack, which comes in four colours – green, blue, grey and red – and can be matched to your kitchen scheme. The only downside is that you’ll need space to house it as the body doesn’t fold down. From birth up until six months the Polly Magic Relax can be used as a newborn chair, which can be conveniently positioned away from the floor. This comes in particularly handy if you have an over amorous pet bouncing around. The soft reversible reducer cushion in either a classic anthracite or red colourway is breathable in the summer and snuggly in the winter, while a toy bar offers a little on-board entertainment. When you’re ready to tackle the joys of weaning, the Polly Magic offers eight different height levels and three reclining positions and lets your tot sit up against the table. With machine washable fabric parts and easy-wipe surfaces it will stand you in good stead throughout those challenging weaning days. One for the credit card, the Bloom Fresco comes in nine eye-catching colours including the enticing Bermuda Blue (shown), Canary Yellow, Gala Green, Rock Red and Harvest Orange. Its bold design and lofty stature is suited to the more contemporary of schemes, so it’s one that’s best avoided if you live in a quaint period cottage. With a 91cm tray height, it’s one of the taller designs in our round up, and would work particularly well at the breakfast bar or kitchen counter top. Its height can be easily adjusted via its easy-lift, pneumatic assisted system and the five-point safety harness can be released with one click – these are all great time-saving features, ideal after a long day. The chair has three positions so you can use it from newborn up until your tot is 3 years or 36kg, and the 360 degree swivel means baby can be positioned at an angle without you having to move the base. It also has a removable dishwasher safe feeding tray and wheels to protect your floors, from scratches, as opposed to baby food, that is. Phil & Teds space-saving Lobster chair is a great option for smaller spaces or for taking with you on holiday or out and about. Measuring just 35 x 34 x 8cm, the Lobster clips onto pretty much any table or work surface, and packs down flat in its own carry case when not in use. With a wipe-clean fabric seat and dishwasher-friendly removable food tray, it’s a doozy to keep puree-free, with a four-point harness to keep your little one from wriggling free mid-dinner. Considering how lightweight it is, it’s reassuringly sturdy when attached to a table too – just be sure the table is secure enough to take the added weight on one edge, and always read the instructions regarding weight limits (15kg). The perfect alternative to those grubby pub highchairs. This high chair ticks a lot of boxes for those on a budget. The seat is comfy thanks to plenty of wipe-clean padding, and reclines to three positions, which is great if your little one nods off midway through lunch. There are also six different height positions and a five-point harness, plus it folds flat for easier storage. There are two trays that fit into one another here – both removable and dishwasher safe – so you can keep one for playtime, or we liked the fact the top one could be removed after dinner to minimise mess. The tray is a bit of a faff to put back on once removed though, with you needing to pinch the sides while guiding it onto the arms. It's hardly a dealbreaker though, especially at this price, and at 15kg it'll comfortably see you through until baby is 2-3 years old.